For most Americans, a thick fog still shrouds the origins of what has turned out to be the worst financial crisis of modern times. 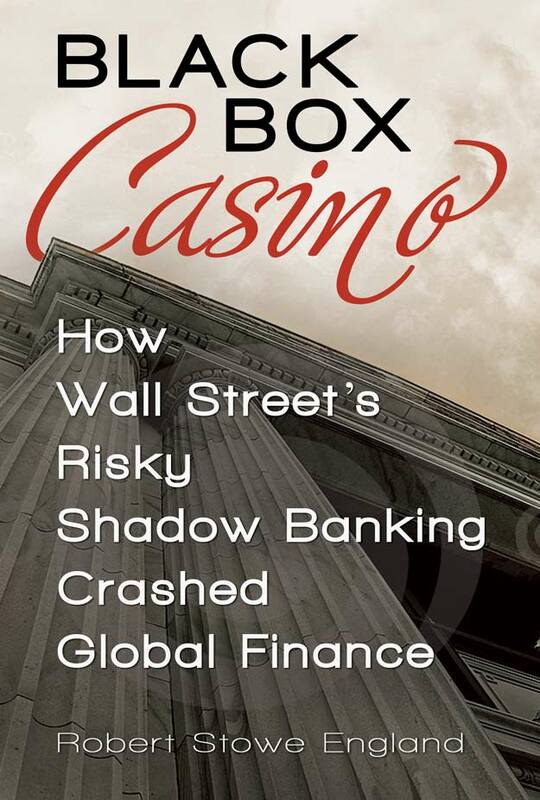 Finding the answer to what went wrong is what compelled me to write Black Box Casino. As senior writer for Mortgage Banking magazine since 1988, I reported on the vast changes sweeping through the industry for more than two decades. In the early 1990s, the mortgage industry was disciplined by the free market. Risky products were priced to cover expected losses. When players miscalculated, they were soon out of business. By August ’07 the entire private sector side of securitization collapsed under the weight of bad mortgages. One year later in September ’08, the government-sponsored enterprise or GSE side of the market – Fannie Mae and Freddie Mac – failed and had to be nationalized. So far, their failure has cost the taxpayers nearly $189 billion. And the tally is still rising. That was said before the Securities and Exchange Commission in December charged six former Fannie and Freddie executives with fraud for engaging in substantial subprime and risky lending while lying about it to the public and investors. Never has a market so large – at $11 trillion in ’08 the largest securities market in the world at the time – failed so thoroughly and spectacularly. The failure of the U.S. mortgage industry is the underlying event that created trillions in toxic assets spread around the globe that set the stage for the larger financial crisis. In the debate over who and what caused the crisis, it is important to understand the difference between fundamental causes that created the conditions for the crisis and the proximate causes. I think there is fairly widespread agreement that the Lehman Brothers bankruptcy brought us the larger crisis. The failure of Lehman did not occur in a vacuum and would not have happened without the fallout from the mortgage meltdown. Fannie and Freddie’s role is foundational because they were the key contributors to the fundamental transformation of the mortgage market from a sound one to an unsound one. They were part of a larger set of housing policies in Washington set up in the mid-1990s that set the mortgage market on the road to ruin. Congress is the ultimate responsible party for the failure of Fannie and Freddie because Congress wrote a terribly flawed and harmful law in 1992 to govern the two government-sponsored enterprises or GSEs. That law is called the Federal Housing Enterprises Financial Safety and Soundness Act – or simply the GSE Act. Its provisions did not assure safety and soundness – indeed, they worked to guarantee the institutions would fail. This maverick Texan, admired because he was one of the very few in Congress who refused campaign contributions from PACs, secretly handed over the writing of the law to an informal alliance of housing activists, who were not at all interested in safety and soundness. The activists, in turn, worked with Jim Johnson, chairman of Fannie Mae, to hammer out a set of provisions for the law. The agreements they reached were introduced as Gonzalez’s own bill and became law. I also blame all subsequent Congresses for failing to deal in a timely fashion with the problems created by the 102nd Congress. In what must be a record for legislative malpractice, virtually every provision in the GSE Act created moral hazard. The law seemed to have been set up first and foremost to benefit politicians and reward executives at Fannie and Freddie, and generate funds for community and housing advocates. The public interest and everyone else be damned. The law set up capital standards that were far too low – 0.45 percent of capital against the guarantees by Fannie and Freddie they would pay investors their regulator payments of principal and interest of underlying loans should fail. That’s a staggering leverage of 200 to 1. Well-capitalized banks, by contrast are leveraged no more than 10 to 1. The regulator for Fannie and Freddie – the Office of Federal Housing Enterprise Oversight or OFHEO – was not an independent agency, but housed within the Department of Housing and Urban Affairs or HUD. You can give part of the blame for that to the first Bush Administration’s Treasury Secretary Jim Brady, who wanted to see OFHEO under HUD’s thumb. Under the GSE Act, Fannie and Freddie did not have to audit their financial statements or file disclosures with the SEC. This legally-sanctioned cover of darkness created an environment where executives could manipulate earnings and increase compensation – which they did with gusto and paid no penalty. Even after the accounting scandals were exposed, Franklin Raines at Fannie got $92 million; Leland Brendsel at Freddie got $25 million. Indeed, Fannie and Freddie became the exemplar of the modern crony capitalist that Wall Street imitated. The GSE Act also gave HUD the authority to set affordable housing goals – which are credit allocation schemes aimed at three designated population targets: a broad low and middle income target, a smaller target for low income only, as well as goal for rural and urban geographies with high levels of low income and minority households. OFHEO had no say in HUD’s decisions on raising the affordable housing goals and no authority to require Fannie and Freddie to increase their capital to compensate for higher risk. Given the political appeal for members Congress to boast they were providing housing for targeted populations, it was inevitable the political incentives created by the law would lead HUD to raise affordable housing goals ever higher and higher until Fannie and Freddie failed. And so they did after 16 years. The affordable housing goal for low and moderate income rose from 30 percent to 57 percent. The low-income goal rose from 11 percent to 27 percent. Fannie and Freddie could not achieve these goals without steady, significant, and even reckless declines in lending standards. Fannie and Freddie also acquired hundreds of billions in private label mortgage-backed securities and held them in their portfolio. They were allowed to count thoseo against their affordable housing goals. Former Federal Housing Finance Agency director Jim Lockhart has said Fannie and Freddie could not have met their affordable housing goals without buying the private label securities. In ’04, for example, the GSEs bought 45 percent of all new issues of subprime private label securities. By mid-’08, Fannie and Freddie held $2 trillion of $4.8 trillion in risky mortgages outstanding in the market. Another $900 billion from FHA, VA and other programs brings the government-related total of risky loans to $2.9 trillion – greater than the $1.9 trillion represented by risky loans in the private label market. Thus, the government share was 60 percent versus 40 percent for the private sector. While Fannie and Freddie drove the trend to riskier and riskier mortgages in the 1990s and early 2000s, beginning around ’03 and ’04, the private sector took the lead. Private label had gained a dominant share of mortgage securitization by ’05 – mostly by greatly expanding subprime and the Alt-A business. Alt-A stands for Alternative A mortgages, which are mortgages with prime or A credits but with reduced or no documentation of earnings and assets. These include so-called “liar loans” where borrowers state but do not document their income. The $1.9 trillion in risky mortgages in the private label side were of poorer credit quality than many, if not most of the risky loans in the government sector. What went wrong in private securitization? For starters, key mortgage originators decided to go for market share at exactly the wrong time. The leader of the pack was Countrywide’s Angelo Mozilo, who set out to increase market share from 11 percent in ’03 to 30 percent in 2010. Countrywide’s origination binge raised its share to nearly 17 percent by ’07, but at a catastrophic price. The company had to be first rescued, then acquired by Bank of America to prevent its failure. Mozilo and many other mortgage bankers, perhaps surprised at the degree to which investors were willing to fund subprime and Alt-A mortgages in the midst of the growing housing bubble, were able to pursue market share schemes and competitive strategies with the reckless abandon of riverboat gamblers. Fannie and Freddie responded to private label’s growing market share by jumping deeply into the adjustable rate mortgage or ARM market in ’04, becoming one of the nation’s biggest predatory lenders with atrocious loan products such as the 2/28 ARM. Why didn’t the private market pull-back and correct? Why didn’t investors in private label stop investing long before the collapse? The answer is that Wall Street found a way to short-circuit a market correction and further expand the subprime party and keep it going for many more years. The investment banker told Bass that in ’03 American institutional investors had stopped buying the non-investment grade or BBB-credit rated tranches or pieces of private label subprime mortgage-backed securities. Credit Suisse and other firms acquire the unwanted BBBs, pool them, and issue tranches in a collateralized debt obligation of CDO. Thus, they tuned 91 percent of the BBB subprime mortgage-backed securities into AAA subprime CDOs. This structure finance magic was justified as sound financial engineering. The idea was that geographic diversification of the loans across the national would prevent the level of losses from a regional downturn in housing, like the one in Texas in the 1980s or New England in the 1990s. With 9 percent of the deal to serve as a buffer, even a regional recession would not imperil cash flow to the AAAs. No one modeled the possibility of a nationwide housing decline. It wasn’t on anyone’s radar. American investors were skeptical of the AAA CDOs, knowing full well they were BBB mortgage-backed securities in AAA disguise. Bass learned Wall Street was marketing the CDOs to foreign investors with dollar surpluses who needed dollar-denominated investments that fell for them, including banks and investors in Asia and Europe. Wall Street would never have been able to engage in this financial alchemy without a key decision made earlier by the Basel Committee on Banking Supervision, representing the major central banks of the world. The Basel Committee recommended in 1999 in a white paper that private label AAA mortgage-backed securities be given the same low 1.6 percent capital requirement as Fannie and Freddie securities and that credit-rating agencies like Moody’s and S&P rate the deals. The U.S. banking regulators adopted this approach in ’01. Moody’s strongly objected to the Basel Committee’s proposal when it was released and warned it would create moral hazard and undermine the credit ratings process. Basel ignored the warning. We all now know Moody’s was right. As the subprime CDO market took off in ’05 and ’06, Merrill Lynch under Stanley O’Neal and Citigroup under Chuck Prince expanded their business at the peak of the frenzy to become the biggest players with most toxic assets. Meanwhile another great secular trend – shadow banking – made the global markets more vulnerable to panics. A vast increase in overnight lending at very low interest rates provided easy money to acquire high-yielding assets, like subprime mortgage securities and CDOs. Two hedge funds at Bear Stearns, relying heavily on overnight funding, invested mostly in subprime mortgage securities and CDOs. The collapse of the two funds in June ’07 dramatically exposed the vulnerabilities of the shadow banking system to toxic mortgage assets. Yet, the regulators failed to grasp to significance of what was happening. Less than two months later, in August ’07, the entire world of private label mortgage-backed securities collapsed – and with it the entire market for all asset-backed securities and all CDOs – markets that nothing to do with mortgages. Synthetic CDOs brought their own special added risks to the financial system. 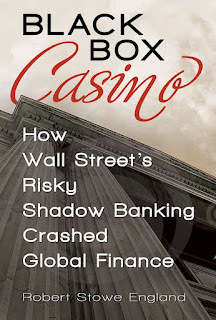 They greatly increased the size of bets made on subprime securities and, when those assets crashed, greatly magnified the damage of the bets around the globe. Synthetic CDOs were made possible by credit default swap contracts. The credit default swap was invented by Blythe Masters at JP Morgan in 1995. It ushered in a new kind of shadow insurance. On one side of each swap contract was the protection seller and on the other was the protection buyer. The Wall Street firms that arranged the CDOs were the initial protection sellers and guaranteed the timely payment of principal and interest on one side of the credit default swap contracts. Savvy hedge fund investors snapped up the other side of the contract, standing to benefit when subprime cratered. Wall Street firms were able to put together synthetic CDOs because they could buy insurance protection from AIG and others to cover their guarantees. The synthetic CDO was even more perverse than the cash CDO because it created opposing interests betting for and against the deal. Some investors did not understand the idea of opposing interests and assumed deals were put together to be good investments. Even at AIG people were slow to realize their insurance against subprime loans might encourage CDO managers to create a pool of bad assets chosen intentionally because they expected them to fail. Hedge fund manager John Paulson made $15 billion in ’07 betting against subprime securities. These were zero-sum bets where other parties had to lose $15 billion. Follies abounded on Wall Street. For example, to keep the CDO mania going, Wall Street firms began to sell one other their BBB tranches because no one else wanted them. Wall Street banks, after AIG got out of the business, held onto the credit protection risk in the deals. The demand for weaker subprime credits had a perverse effect. To generate the BBB’s that went into the CDO, about ten times as many subprime AAAs and AAs had to be created. To meet the overall demand by CDOs for subprime private MBS, Wall Street firms pressed mortgage lenders to increase the overall level of subprime and risky mortgages. While securitization of mortgage loans was supposed to distribute risk widely and thus improve the safety and soundness of the global financial system, it instead did the opposite. Banks and Wall Street firms ended up holding concentrations of toxic assets. While losses were also spread across the globe, the losses were greatly magnified through the use of naked credit default swaps. Those are bets for or against reference securities that neither party owns. It’s like buying insurance on someone else’s house. If the house should burn, you would collect. The overall level of bets using credit default swaps hit $45 trillion in ’07 against actual assets of $25 trillion, meaning that there were $20 trillion in naked credit default swaps that were pure casino bets. We don’t really know how much of that $20 trillion was bet on subprime. If Wall Street had not developed the subprime CDO and the subprime originations had remained at the ’02 level, there would have been $1.15 trillion less in private label mortgage backed securities generated by ’07. There would likely not have been any of $700 billion in subprime CDOs. Without synthetic subprime CDOs, trillions in credit default swap casino bets on subprime would not have been made. The entire crisis would likely have been far, far less severe. The hand of Fannie and Freddie can also be seen in the CDO market. As the largest buyers of subprime mortgage-backed securities, they helped generate the deals that provided the raw material for the CDOs. Without them, the volume of subprime securities and CDOs would have been smaller. Further, if Fannie and Freddie had limited themselves to buying sound prime loans and securities, after the bubble burst, housing prices would likely have seen lower price declines than we have seen. That would be the case because there would have been fewer bad mortgages outstanding and likely to fail and, thus, less houses would have come on the market. With less supply of foreclosed homes, the hit to private label mortgage-backed securities would have been less pronounced. It was a combination of bad assets and flighty funding that brought the crisis to every major Wall Street investment bank. Bear Stearns became the first major victim of the fears about the level of toxic assets on balance sheets. Alan Schwartz, former Bear Stearns CEO, has acknowledged this point. The consequences of the panic over what was feared to lurk on Bear Stearns balance sheet was magnified by a critical error made by the SEC in ’07, when the agency did away with the uptick rule. This rule, first adopted in 1938, disallowed short selling of securities except on an uptick or small increase in the price of a security. In particular, the end of the uptick rule made in possible for market manipulators to engage in naked short selling on a vast scale and conduct bear raids that could completely crash their target. A naked short sale is when someone sells a security they do not own or have not borrowed – it is illegal. Like a hoard of locusts, naked short sellers descended on a wounded Bear Stearns. It all began on March 11, ’08, when an unidentified party made a $1.7 million bet through put options that Bear Stearns would collapse within 10 days. Rumors circulated on Wall Street that Bear Stearns was out of cash even though they had $18 billion on hand. Panicky investment funds began to pull out their brokerage accounts and overnight funders stopped lending. In only a few short days, Bear Stearns was down to $2 billion in cash and on the verge of collapse. Over a period of days unknown parties placed sell orders for more than ten million shares of Bear Stearns they did not own or borrow and failed to deliver when the settlement date arrived. Before the bear run, Bear Stearns had a share price of $62. But in a matter of days, the company agreed to be sold to JPMorgan Chase for $2 a share or $236 million, less than the value of its corporate headquarters. Meanwhile, the party who had place the $1.7 million bet pocketed a larger gain of $271 million. While the collapse of Bears Stearns should have been a wake-up call to Chris Cox at the SEC and Hank Paulson at Treasury, no one took steps to prevent naked short selling from bringing down other investment banks as the market now feared. Only six months later in September ’08, naked short sellers struck again. Unknown parties sold tens of millions of shares of Lehman Brothers they did not own or borrow. In a matter of days they forced the company into bankruptcy, precipitating the financial crisis of ’08. The regulators could have forestalled Lehman by temporarily banning short sales on key financial firms – something they did after Lehman to stop a run on Morgan Stanley and Goldman Sachs – or reinstating the uptick rule on an emergency basis. Having failed to take the steps that could have prevented the crisis, could they have still forestalled Lehman’s bankruptcy at the 11th hour? I believe Lehman could have been saved so that a private sector resolution, already negotiated, could proceed to closure. And I’m not talking about a TARP bailout either. Lehman failed before TARP. Under Treasury’s lead, federal officials were working over the summer of ’08 to break Lehman into a good bank and bad bank and sell off each separately – without government funds. The good bank would be sold to a willing buyer looking to pick up Lehman’s best assets for a deep discount. Paulson wanted a consortium of major banks to buy Lehman’s bad assets and place them into a special purpose vehicle as was done with Bear Stearns. Paulson called together the heads of the major banks at the New York Fed. These CEOs reached agreement to fund the purchase of the bad assets. They also agreed to share an estimated $10 billion in losses to acquire the bad assets from Lehman. Thus, a private sector solution without a government bailout was about to be consummated. The only major thing unsettled at that point was whether or not there was a buyer for the good assets at Lehman. There was one hitch from the UK’s Chancellor of the Exchequer Alistair Darling. He told Paulson Barclays could not guarantee Lehman’s assets from the time the deal was struck until the time Barclays board could meet and agree on the deal, which could be 30 to 60 days. Another party would have to take on that temporary exposure. The most likely candidate was the Federal Reserve. Bernanke, in testimony, has claimed the Fed could not engage in loans or guarantees at Lehman because the value of the assets at Lehman were insufficient to cover the Fed’s exposure. Neither Bernanke nor Paulson have ever revealed what options they were considering when they let Lehman go bankrupt, including an option of having the Fed temporarily guarantee Lehman’s trades. Fed historian Allan Meltzer claimed the Fed could have guaranteed the trades and its failure to do so constitutes the biggest mistake in the history of the central bank. I would agree. So where are we today? No major actor in the crisis who committed fraud or engaged in reckless lending or market manipulation and made fortunes in the process has been brought to justice or paid a price commensurate with their misdeeds. Given that my remarks may leave you with the feeling that Washington looks like the gang they couldn’t shoot straight, let me say that all is not lost. There are some positive developments. Surprisingly, Timothy Geithner’s Treasury Department demonstrated a good understanding of how housing, mortgage and financial markets work. Their white paper last year declared that a future vibrant mortgage and housing market should rely primarily on the private sector. They also called for gradually shutting down Fannie and Freddie. Yet, thanks to Dodd-Frank, bank regulators are in the process of imposing severe restrictions that will significantly limit the availability of mortgage finance and further delay a full housing recovery. One regulator – the Federal Housing Finance Agency – is looking at how Fannie’s and Freddie’s foreclosed housing inventory could be sold to investors who want to convert the houses to rentals. The agency has staunchly refused capital reductions in refinancings, a plus for the markets and taxpayers. Unfortunately, the federal and state attorneys general assault on the legal rights of mortgage investors promises to raise the future cost of securitization and restrict the flow of funds into mortgages.